From the recycled plastic material on the roof down to the concrete garage flooring, everything in this LEED Platinum-certified home was built with conservation in mind. Charles Pickering, founder and CEO of architectural and engineering firm Pickering Associates, hoped to take a big step toward his vision of becoming LEED certified. Gaining certification, though, was no small feat. First, you must develop a project that meets LEED criteria. Taking a look at the empty space on his property, Charles found the perfect location for his new home and soon began designing the first LEED Platinum home in West Virginia. The project took nearly six months to design with the help of a few Pickering Associates architects, and roughly a year to construct. 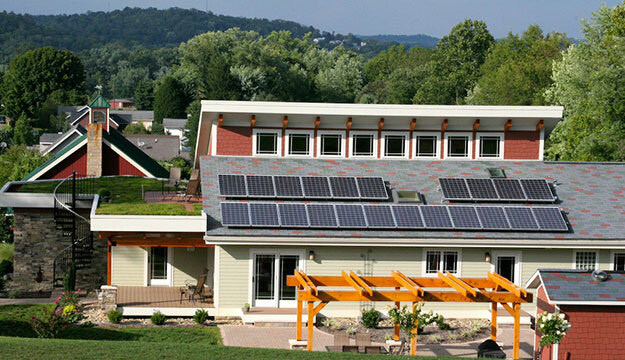 As the project developed from a conceptual idea to a fully scaled net-zero energy home, Pickering’s residence consists of a geothermal heating pump, insulated walls and floors, a living green roof, and an EV charging station, in addition to a 11kW photovoltaic (PV) array powered by Enphase microinverters. According to the Home Energy Rating System (HERS) Index, which measures a home’s energy performance, Pickering’s house received a rating of .43. This means that his home’s entire energy consumption is 43 percent of an average home built to 2008 standards. Consisting of Schott Poly 230W modules and M215 microinverters, the PV array delivers enough power to the LEED-certified home to accommodate the family’s energy needs for the long-term, with Enphase’s 25-year limited warranty providing total peace of mind. Pickering’s energy consumption is made up of three main culprits: the air conditioning system, the hot water heater, and refrigeration. Generating 100 percent of the electricity the home requires, Pickering’s Enphase System now saves the Pickerings over $3,700 in yearly electrical costs. On-site clean energy is the foundation for any LEED project, and for that we relied on Enphase.